Works well, looks good, and fits nicely in a corner. None to speak of. 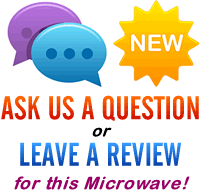 We've already reviewed this microwave once, and so will only provide the main points below to avoid repetition. 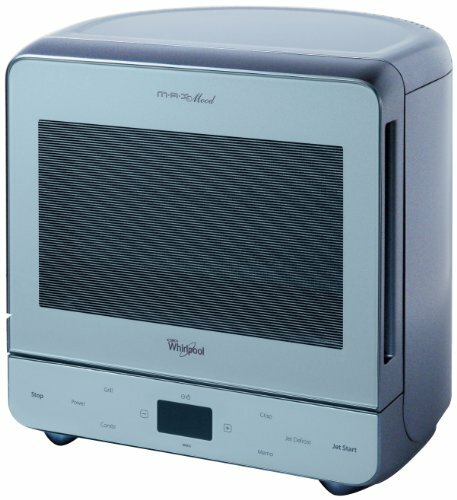 The rounded back design is a characteristic unique to Whirlpool microwaves - it enables you to place the microwave deeper into the corner of a kitchen, thus taking up less room than a traditional rectangular model. This particular model is finished in blue, and overall build quality is good. Overall power output is 750w, and capacity is a modest 13 litres - however due to the curved back, this blue microwave still incorporates a decent sized 28cm turntable. The controls and display are located at the base of the unit to save space - each are clearly labelled, and our testers found operating the microwave to be pretty easy. The LED display is clear to read, even in bright sunlight, and features a 24 hour clock. Five different power levels are included, together with a grill facility, enabling you to crisp and brown food. If you're looking for an unusual yet reliable microwave, then the Max 38 Crisp is worth considering. After a blue microwave with a grill feature? If so, your options are fairly limited - however this model is worth taking a look at - it's well built, reliable and performs well.